Is your wallet empty? And you still need to boost your team's performance? Building team morale is difficult in these tough economic times. Kevin Aguanno helps you solve the team morale problem with ideas for rewarding your project team without breaking the bank. 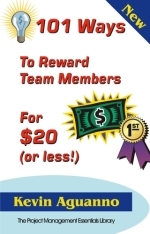 Learn over 100 ways you can reward your project team and individual team members for just a few dollars. Full of innovative (and cheap!) ideas. Even with the best reward ideas, rewards can fall flat if they are not suitable to the person, the organization, the situation, or the magnitude of the accomplishment. Learn the four key factors that will maximize the impact of your rewards, and guarantee a delighted recipient.